What is the MOQ? MOQ for airline amenity items is approximately 5,000 units per item. Are quantity discounts available? Yes, while each brand has its own cost structure, we can normally quote a discounted price based on quantity per shipment. What is the shipping point? Domestic shipments: Varies Export Shipments: West coast = California postal code 90221, near the port in Los Angeles and LAX airport. East coast = New Jersey postal code 07083, near the ports in New York/New Jersey and JFK airport. Can you quote on a delivered basis? Shipments are ex-warehouse. Do you pack kits? No, we focus on being a dependable supply-chain partner for leading hotel-amenity suppliers and companies that pack these products into airline kits. The Garden Voyage Botanicals® travel range artwork has been updated with a botanical design element on each product. The original “classic” design is still available as well. 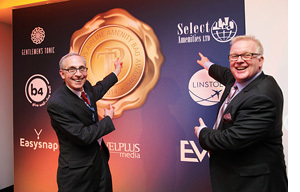 Vince McIntosh and Simon Ward of TravelPlus pointing out updated company logos during a recent TravelPlus Amenity Bag Awards event in Hamburg, Germany.